Check this out! Rani and Her Class of Fourteen Bring the Beat Alive with Madamji, Go Easy in the new song from Hichki! The catchy, street style cool song features her onscreen students, the motley crew of section 9F and captures the irreverent, rebellious and energetic spirit of these young adults grappling with life in the basti, their poor neighborhood. 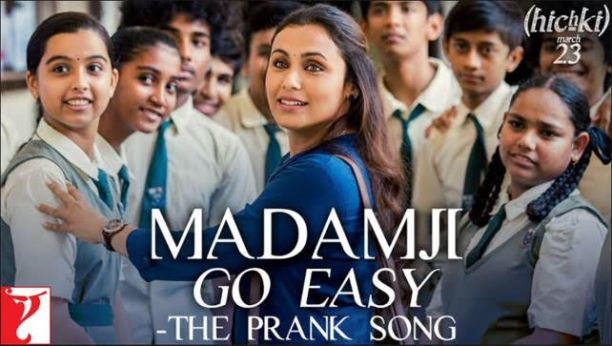 Sung by Benny Dayal and David Klyton, and with lyrics by Raj Shekhar and David Kylton, the spunky Madamji, Go Easy is a rap meets desi hip hop track, reflecting a popular organic music form that has emerged from India’s slums and poorer urban neighborhoods. With catchy lyrics like “Sab wi-fi, hum 3G” and colloquial Mumbai terms like “Matha Pacchi”, this Hichki song has the thump and beat of popular street poetry. With Tamil rap interspersed and Mumbaiya Hindi, the words of this song get your head bobbing and your feet tapping. In Hichki, which hits theaters on March 23rd, Rani plays the character of Naina Mathur who has a nervous system disorder, Tourette Syndrome that forces an individual to make involuntary repetitive movements or sounds. Hichki focusses on turning disadvantages into opportunities and staring down at challenges that life throws at one and ultimately winning over them. It is also a subtle reminder about discrimination that exists in our society and has become a part of our daily lives. It highlights this through the story of Naina, who faces discrimination from our society that firmly believes she cannot be a teacher because of her disorder. 15 queries in 0.335 seconds.